Today is the day we celebrate the life of St. Patrick. Kidnapped and taken to Ireland as a small boy, Patrick later returned to share his faith with the people of the Emerald Isle. St. Patrick is honored as the patron Saint of Ireland, his adopted homeland. His feast day is celebrated by those of Irish heritage, and by many who are not. In many places it my seem the celebration has become more of a drinking holiday than a celebration of St. Patrick and all things Irish. The idea of a Budweiser St. Patrick's Day beer stein might be a bit odd, but that's okay. Today everyone is Irish. Celebrate as you wish, be safe, and have fun. 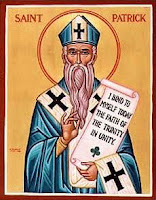 St. Patrick is also our parish patron Saint, so we'll take a wee reprieve from our Lenten sacrifices. We'll honor St. Patrick quietly with a meal at home and raise a pint or two. (However, there will be NO green beer served here.) In whatever way you choose to mark St. Patrick's Day, and whether you claim Irish decent or not, make it a celebration worthy of the day's namesake.